Kurt Andersen's Vanity Fair piece, "You Say You Want a Devolution" attracted avid attention, including a hat-tip from Cathy Horyn, whose own NYT article, "Just Getting On With It" is also worth your time. Horyn quotes Kurt Lagerfeld advocating "dressing up in jewels" while the Duchess of Cambridge chose a $100 Zara number. O tempora! O mores! Andersen's thesis: "The world may have changed profoundly in the last 20 years, but stylistically the recent past looks almost identical to the present." For example, clothes in photos from the 1950s look entirely different from those of the 1970s, but '90's and now? Nearly indiscernible. He calls the present a Been There Done That Mashup Age, caused by our limited capacity to absorb change on every front. Modernity eyes are bigger than the modernity stomach and all our space has been taken up by technology innovation. I've been annoyed for awhile that items I wore thirty or forty years ago are trotted out as trends, but unlike Andersen, am less eager for the appearance of the Radical New as far as style goes. The Radical New is expensive, as I recall from the days when styles changed markedly every few years. Shoulder pads were in, then out; your jacket would not hang right, all your skirts needed to be shortened this minute. And Radical New on a woman who is not so new herself can look victimy if one is not in firm possession of a personal style syllabus. At the other end of the consumer spectrum are the craft shows now ubiquitous as fairy lights in Montreal. (Some carefully avoid the c-word, summoning as it does the image of a horde of middle-aged women swarming stalls of felted scarves.) I've visited several, and found high levels of design, even innovation, and reasonable prices. The shows are packed with young couples hauling unsteady toddlers, looking to buy locally, to form a relationship that they hope ennobles consumption, if only a little. We many not need soaps that look like cupcakes, but it's pleasant to buy them from a chipper young man who made them over his summer vacation. They are heavy on reverence for the past: letterpress coasters, home canning, birch bark lamps, upcycled knitted collars. At one of these shows, I saw a 20ish vendor in a below-the-knee tartan pleated skirt, with a striped vest. I paused to enjoy her colour sense, then thought, You just don't see those pleated wool skirts anymore. I imagined her combing racks at a jumble sale. She looked utterly individual, standing out in a sea of skinny-jeans-and-tall-boots. She illustrated Andersen's point: the new personal style is formed by recycling the old, these days. Andersen fears we are losing our edge, that nostalgia and steampunk will clobber our creative energy for making the fresh, the fantastic, the next great thing. I say, fine. Unemployment is still cringingly high (especially among youth and post-50 workers), families are digging out of debt, the economy falters. How many 40% off and free shipping offers are in your inbox? Let's continue to borrow from the past without guilt, to wear our coats longer, carry a cloth tote instead of an It Bag, resist the trill of the fashion timer. There is room for the innovative, always, but the Radical New will not have dominion over women's dreams until more of us are working again, or feeling safer about our savings. As so often happens, you've been reading my heart! Haven't read either of the two NY pieces, but your reading seems spot on to me. Bravo! Raised on recycled clothes, though, and having built much of my teen-age wardrobe from church rummage sales (my mom always knew how to find the best ones), I'm amused to recognize that pleated wool skirt. I treasured two, for several years in my late teens. They were already part of a trend of thrifted re-mixing in those creative 60s -- what goes around comes around. . . and around . . . and around. I think some of the lack of change is due to two big changes: women in pants (when I was in grade school, girls had to wear skirts to school--in winter, we had to wear pants under skirts) and jeans for everyone. Who would want to go back? I'm with you, Duchesse, and agree with Frugal Scholar about the tidal influence of jeans-for-everyone. The recent sharp drop-off in quality of mid-priced retail fabrics and workmanship (I know you've written about this, too) has sent me to thrift shops--and the back of my own closet--in search of good silks and woolens, well-dyed and sewn, to pair with a great new pair of jeans (one item that seems to have maintained quality.) I'm enjoying the resulting "mash-up" looks very much. I haven't read either piece yet, but yes! 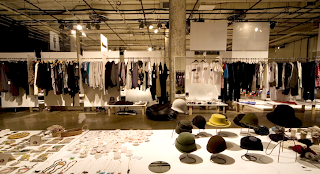 Why long for overarching fashion trends that will look dated in two years' time and require major reinvestment, either in alterations or replacement? I like to think we're just all getting smarter about fashion. I notice that even among younger women, their fashion icons seem to be the Audrey's, the Katherine's, the Jackie's, the really classic and timeless looks. I agree with Susan's comment that people are getting smarter about fashion. Also, the technology available to people offers so many options for creativity that perhaps personal style isn't as important of a creative outlet as it was once? Vivienne: Maybe that's why I was so happy to see your offer to Frugal Scholar. There is such wisdom in wearing some of these beloved items. materfamilias: Exactly. I had the pleated wool skirts of my sister, 13 years older (but my mother never discarded any 'perfectly good' clothes). I too viewed them as vintage and desirable. Frugal Scholar: You have, I think, found the passkey, pants and the jeans subset. C.: Thought I was guilty of overly-nostalgic longings but quailty seemed everywhere when I was growing up, but women demanded it. Now, J. Crew is putting acrylic in what were once pure wool sweaters. (Not that they have ever been high end, but were once honest preppy things.) Overall jeans are good quality but I have found, also always on sale somewhere. Susan: I think, whether one is creative or not (however that is defined) what one wears makes a statement (including "I don't care".) And yes, there are so many wonderful tools for expression now. The blog world is but one more. You know, I also wonder if the comfort factor doesn't also play a part. The explosion of knits, fabrics with stretch (esp. denim), yogawear as streetwear...perhaps people just don't want to go back to being uncomfortable. I notice that even on recent Paris visits, knits, jeans, softer silhouettes were everywhere. Spaniards have always been frugal (and closets in Europe are small), but "el crísis" has turned the clock back from a recent and very brief period of shopping madness. Probably not such a bad thing! Rubi: In my former home, Toronto, there was a "thing" for teens, to wear extremely light clothing when it was cold as if to say, We are young and invincible over temperature. Just a t-shirt at 0C, for example. No winter boots no matter how much snow. You would see young bucks in the subway, -5C, in flip flops, no socks. In Montreal, the young are unwilling to get hypothermia to be cool, so Triple Fat goose down rules, along with hip hats and big mufflers. And they actually wear gloves instead of scrunching blue fingers into sleeves. Sometimes it's just a little detail that makes an article of clothing look dated after a year or two. How wasteful. I'll all for the tried and true as long as it it well made, graceful to wear, and flattering. Now, where can I find those things? 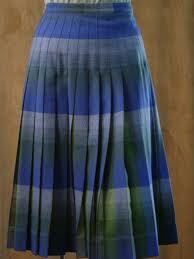 wow,, weren't they Pendleton, those pleated skirts. And reversible? I had one of those skirts in high school in the 70s; and my mother had one just like it when she was in high school in the 50s! Mine was dark midnight brown, green and gold, so beautifully made - and reversible! Each decade had a distinct fashion. But since 2000, that hasn't happened anymore. For men it's spiky hair, collared shirts and jeans. It hasn't changed in 10+ years! I think something has broken in out collective subconscious. Was it 911? 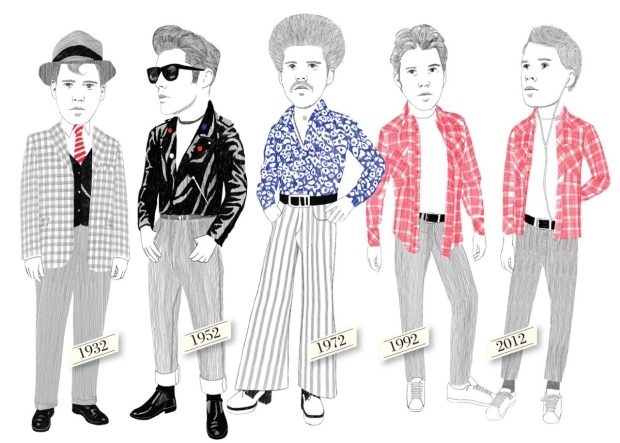 Was there a handful of trendsetters in the 80's who have since passed away? We're all stuck. Trevor: When I think back on the last time I was truly startled by the way men's looks had changed, I go back even before 9/11, to punk.